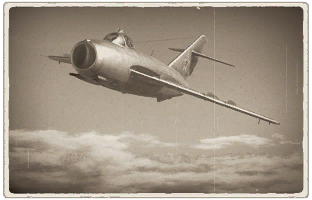 The MiG-17 is a Rank V Soviet jet fighter with a battle rating of 9.0. It was introduced in Update 1.55 "Royal Armour". The MiG-17 is the top-rank aircraft in the Soviet fighter line-up. It is known by many names in the world, with a NATO reporting name of Fresco, the Chinese name Shenyang J-5 (歼-5), and the Polish name PZL-Mielec Lim-5. 60 mm Bulletproof glass in cockpit front. 10 mm Steel plate in the nose. The newly gained top speed performance and maneuverbility come at a hefty price. Turn rate and low speed flexibility is gone, due the stronger swept wing design and gained a quarter·tonnes. Acceleration also takes a hit, especially on take-off the predecessor will rush ahead. As some positive characteristics traits of the MiG-15 vanish, some negative aspect vanish. The newly designed tail enables far better control close over Mach 0.8 (it still lacks a flying tail though) and the roll rate also significantly improved. Manual limitation set the airframe at positive 8G, with the increased control the likelihood of over stressing your airframe is easy and a steady hand required in evasive maneuvers. Incredibly fast in a dive. The Korean war showed that the MiG-15 and MiG-15 bis fighters were able to battle any aerial opponent at least on equal terms. The MiG-17 was a further development of the MiG-15 design that had proven itself so well. It was decided to increase the aircraft’s speed by increasing the sweep of the wing and the fuselage being lengthened to maintain the centre of gravity. The MiG-15 and MiG-17 show almost no differences at first glance. The prototype of the MiG-17 was even called the MiG-15bis45. However, only the frontal parts of the fuselage are the same, from the air intake to the wing, if you don’t count the landing headlight that had been moved to the left wing and some minor details. These aircraft are different in every other way. It is easy to see the main differences when you look from above. By comparing the side profiles, you can see that in addition to the difference in fuselage length there are differences in the tail fin and an additional ventral fin which allows you to immediately tell the MiG-17 apart from the MiG-15. The upper part of the fins and the rudders of the aircraft are different, the juncture between the fin and the stabilizer fin also differs, but this can only be seen close up. The wing sweep of the stabilizer fin was also increased and there were also changes to elevators. The air brakes also differ in shape and size. The depth of the housing was decreased, so a cigar-shaped cowl was created to hide the cylinder. There were very significant changes to the wing. Apart from an increased wing sweep, a leading edge break appeared and the tips became rounder, which helps differentiate the aircraft when looking at them from above or below. While the Mig-15 had two aerodynamic ridges on the top surface of its wings, the MiG-17 had three. The change in the shape of the wing led to appropriate changes in the construction of the flaps. The new geometry of the main landing gear legs required for the cover to be altered. The structure of the canopy also saw some changes. However, the first versions of the MiG-17 had the same canopies as the MiG-15 bis. Apart from changes to the design of the canopy framing (which is not actually that noticeable from afar), a rear-view mirror was introduced that would allow the aircraft to be recognized from further away. There were no significant changes to the cockpit. 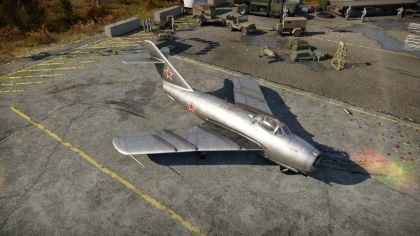 Overall, the MiG-17 looks even more aesthetically pleasing and streamlined than its predecessor. This page was last edited on 25 February 2019, at 01:52.